Besides sharing a passion for open-wheel racing, Tony Kanaan, Scott Dixon, Sarah Fisher and even Robin Miller all have something else in common: they’ve all spoken to the P-Dog. Forget Dave Despain, when people in the racing world want to get heard they go to the man who not only speaks TO the masses but also FOR the masses. There is pressdog, and then there’s everyone else. 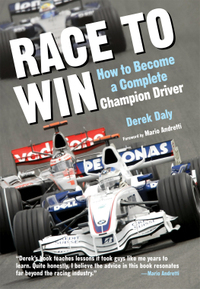 The deal is Derek Daly has penned a new book called “Race To Win”, and like the aforementioned folks he’s gone to the ‘Dog for an extensive discussion. Yeah, Mr Daly never actually won an Indy-Kerr or F1 race, but that doesn’t disqualify him from discussing what it takes to compete at the upper levels of open-wheel motorsport. Besides, he's still a colorful communicator so it's probably a fun read. The bonus for you is that there is a FREE AUTOGRAPHED COPY of the book - currently sitting on an undisclosed desk in Iowa - that could be in your hands should you win the contest pressdog is holding. Go check it out at pressdog.com for all the sordid details. I'm just trying to live up to the MNII standard. It's challenging. I appreciate the big shout out and ink (er, pixels). Double D is in the whiskey! I heard Daly slams Montoya in his book, not buying it, lol. I can tell ya, DD isn't real enamored with Juan P.
Then THAT makes me a Double D fan for life! P-Dog, did you get any chance to ask Mr. Daly if he's considered announcing for the "mergificated" IRL?